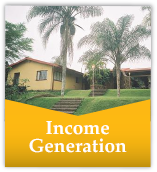 The Desmond Tutu Centre for Leadership, also known as C4L, is a nonprofit organization located at White River in Mpumalanga Province, South Africa. It has downsized to a small campus affectionately called "Finkenwalde" after the on-the-run training facility established by Dietrich Bonhoeffer for the Confessing Church (in Germany) almost a century ago. It is not only a place of learning, but also a base for "speaking truth to power". 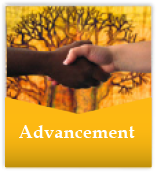 Our contact with communities over two decades - especially the Youth - positions us to debate issues that affect communities and Youth. C4L is also moving slowly into the Internet environment as the "digital divide" gradually closes, bringing Africa onto the information highway. It's election year in South Africa. The campaign is speeding up, in the run-up to election day on May 8th. C4L is busy with its Voter Education project on the ground. But it also monitors election issues and speaks into various debates. Here are some articles that were run on national media platforms, and others that were declined. Free Education. Free Land. Free Weed. Could opposition parties with ‘boggerol’ in common rule SA? How about an All-Star Coalition to beat the ANC? 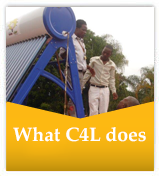 C4L has streamlined this site, not for its Learners but for its Partners. In short, this is not the place for Youth to register. It is the space for Partners to "visit" C4L.